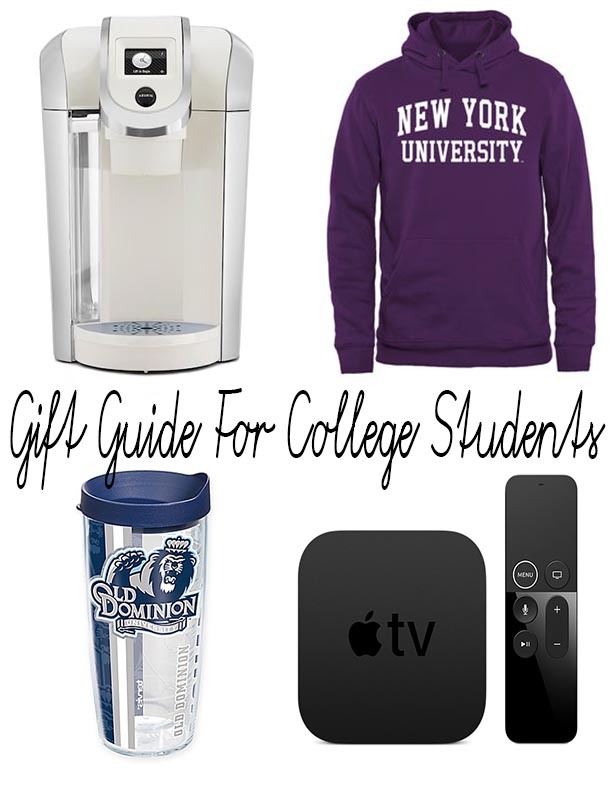 I wanted to add one more gift guide before you finish up your Christmas shopping. If you've got a college student you're buying for or someone who is about to head off to college, let me tell you, it's expensive. Not only is school in general expensive, but it's hard being on your own for the first time and balancing all of your finances. Help a kid out, but supplying them with things that they may need while being away at college! One. Gift Cards // I wanted to start with an easy one, but load them up with Starbucks, Taco Bell, Panera Bread, Chic-Fil-A, or even just grocery store gift cards. They only want to eat the dinner hall food for so long. Two. Keurig // Maybe you want to get them the actual Keurig machine, or just a lot of K-Cups, but they will appreciate it because you'll be saving them time and money in the long run. Three. College Apparel // The most tempting thing to do is to buy any and all of the t-shirts with their college name on it. My brother just got accepted to American University so you know were going to deck him out in a ton of AU stuff. Plus, they're the most comfy things to wear to class when you don't feel like dressing up. Four. Sneakers // You do a lot of walking as a college student. And like I said, most of the time you throw on a comfy shirt and leggings and you're off. Make sure you're wearing comfy shoes too. A pair of really nice sneakers is a great gift for any college student. Plus, you know they'll get a lot of use out of them! Five. Electronics // This one is broad, but it's a must! Everything form a new laptop or a Bluetooth speaker would be a great gift! College kids work hard, but they play hard too... with Netflix. Apple TV, Amazon Firestick, and Google Home or Amazon Alexa would complete any college kids dorm room! What else should I add to this list? Let me know by commenting down below.